Spring is around the corner which means the spring and summer travel is on the horizon too! Travel can be super stressful at times, especially when you’re limited in packing space and have to abide strict by travel rules and regulations. One of the things that I often struggle with the most when packing for vacations is deciding on which toiletries and makeup to bring and also how best to pack them to avoid messes and destroyed products. I can’t tell you how many times I’ve traveled only to open my makeup bag when I arrive to find that my favorite $50 eyeshadow palette has shattered or that a haircare product has leaked and stained clothes that I had packed. It’s the absolute worst! I’ve put together a few tips and helpful advice that I’ve learned over the years to keep your inner pack-rat in check and to keep your travel belongings safe and spill free while traveling. 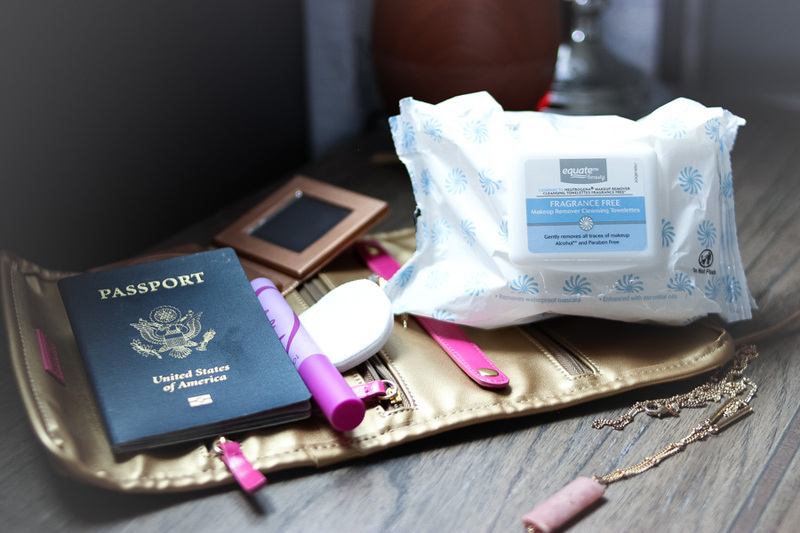 I love using Equate Fragrance Free Makeup Remover facial towelettes when traveling! Actually, I keep a stash in my car and gym bag too for quick on-the-go refreshening and for nights when I’m just too tired to go through my entire skin care routine. While traveling, I try to avoid bringing many liquids that could potentially spill or cause a mess. 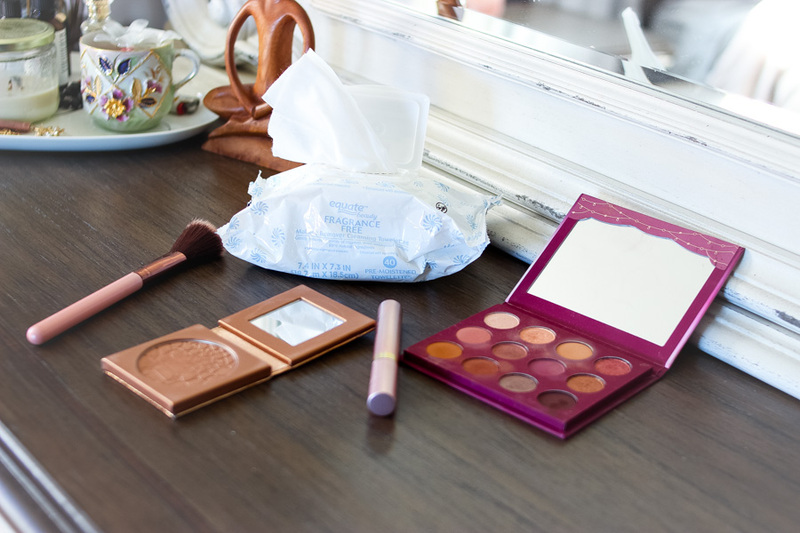 My favorite wipes are Equate Fragrance Free Makeup Remover Towelettes from Walmart (in the beauty or cosmetic section). Not only are these towelettes budget-friendly (less than $5/pack at my local store), but they are made with essential oils and 99% natural ingredients. 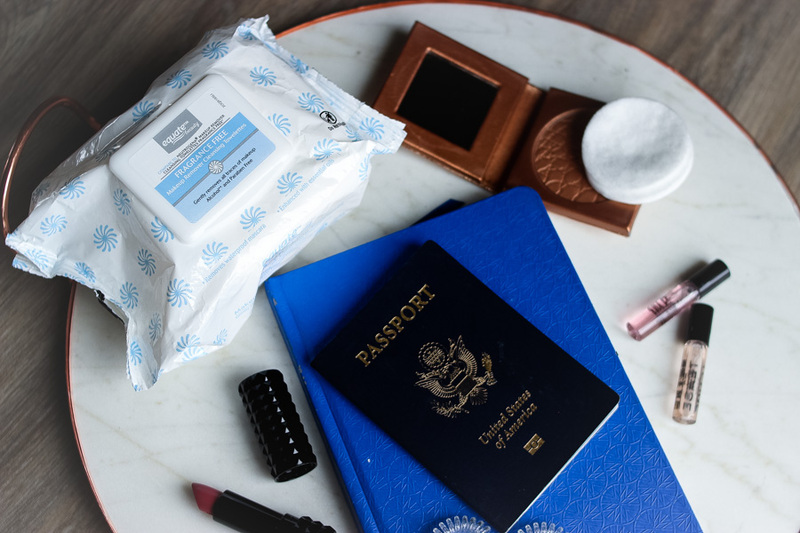 These towelettes are the best at removing all your make-up (even waterproof mascara) after a long day exploring and traveling, especially when you are so exhausted that you just want to tumble into bed. They are the best for keeping on hand to conveniently wipe down dirty surfaces (like icky airplane tray tables) or sticky toddler fingers when traveling. Their multi-use function makes them an absolute must-have! This is pretty basic, but without a list I would surely miss out on packing some essentials! A few days before I know I’ll be traveling, I begin to write out a list of all the beauty products and toiletries that I need. I put into account what type of events and activities that I’ll be attending while on vaca and use that as a basis for what type of products and looks that I’ll be going for. Often I’ll bring along a list into the bathroom with me as I get ready in the morning and write everything that I use or will need. When packing, I actively check off so I don’t miss anything, especially those items that you don’t pack until last minute (like your toothbrush)! While I love my makeup brushes, I usually leave them at home when traveling. Brushes can be bulky, messy and traveling can cause damage to the delicate bristles if you’re not careful. While traveling, I make do with q-tips, sponges and fingers for applying makeup while on the go. 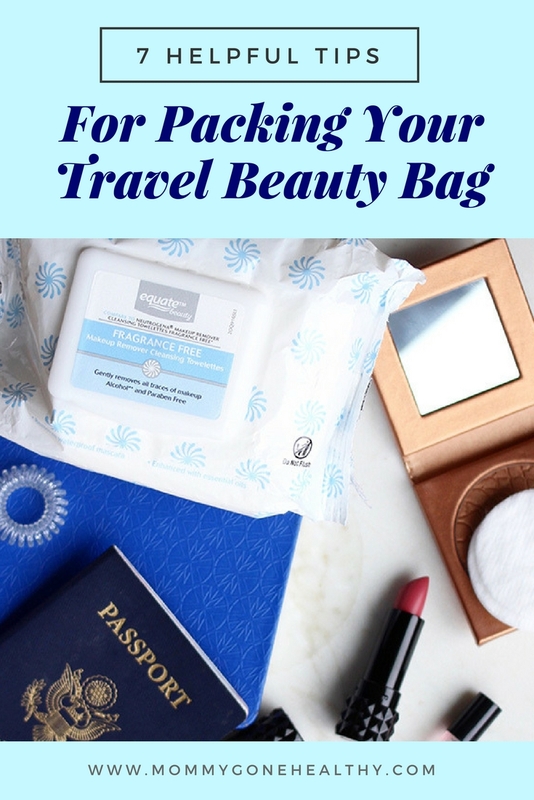 So many beauty products can be multi-functional and when traveling having the ability to use products in multiple ways is a must in order to save space and avoid overpacking. Work towards packing palettes that can do it all, including day and night time looks. Lipstick can be used for blush in a pinch and some soothing facial sprays can work double time as a great makeup setting spray. TSA has so many rules when it comes to liquids on airplanes and avoiding bringing large amounts of limits also decreases your risk of spills (and makes your luggage so much lighter). Currently, you’re allowed to bring a quart-sized bag of liquids, aerosols, gels, creams and pastes in your carry-on bag and through the checkpoint. 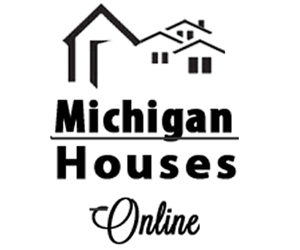 These are limited to travel-sized containers that are 3.4 ounces (100 milliliters) or less per item. Instead of bringing facial cleansers, facial towelettes are a much better option. Switch your full size hair products for travel size or samples. Nix the perfume bottles and bring perfume rollers or samples (I have so many from past Ipsy bags). I like to separate dry and liquid products for quick travel checks. When I get to my destination, I transfer everything into a clear makeup bag or plastic baggie that makes finding my products easy and hassle free. Nothing is worse than opening your travel bag and seeing that you favorite compact or palette has been turned into a mess of broken makeup. When packing compacts and eyeshadow palettes, put a few makeup pads or cotton balls between palettes to add a little cushioning for jostling during your travels. I’d love to hear about some of your favorite travel tips! Also, where is your favorite place to travel to? Yas and yas. Last year we went to Ukraine for almost 4 weeks and girl when I tell you i overpack in everything. I o verpacked lol. Its was my first time flying with a kids. And i just went nuts. I was so worried if i didnt have engough. I ended up not using half of the things i brought. Oh and my my makeup turn out to disastrous becuase i made a list for everything else except make up. Thank you for this post. I also avoid liquids and stick to blenders when traveling. the worst is ruining a good brush! So, I committed to not buying a new make up item until i used the last one (no more blush until I use up the palette I have now, etc) and my bronzer TOTALLY fell apart on a flight. So I have been using this pile of brown craziness for like a year. So I am totally taking your advice next time! Great tip on a padded bag! I nearly cried when we traveled to Las Vegas and my blush broke in the commute!